Count & Mand Procedure - I Love ABA! I dont know what it is about me and grocery stores. I feel like I see so many more meltdowns/ tantrums when I'm inside grocery stores than the average person. Maybe Im just paying more attention because Im a behaviorist...or maybe these people follow me around. Im not really sure. This morning I was standing in the checkout line behind a toddler having a serious meltdown, and a few checkout lines down from me a maybe 5 year old kiddo was kicking up a massive tantrum. Thats not too unusual, as most professionals or parents know behaviors can be "contagious", in that one crying child can set off children all around them to begin crying. What was somewhat unusual, and what tends to catch my attention is the way parents react to these situations. I see lots of begging, pleading, whispered threats, stern looks, grabbing candy bars/toys/keychains to distract the child, picking the child up, digging inside of bags for juice or milk, etc. To summarize, I generally see a reaction of panic. My goal when working with a client is to give so much support, parent education, and training, that the parents don't have to feel panic in a public situation ever again. Its never a good feeling when inside of a quiet store with tons of people in close proximity your child begins to tantrum. Inevitably, all eyes around you either look at you accusingly, or you see people trying very hard and quite noticeably not to look at you. So the question is, "As a Therapist/Parent/Aunt/Uncle/Grandparent how am I supposed to react?" 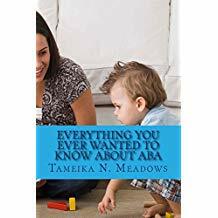 Understand that ABA is about principles of behavior. There are a handful of basic principles (see my ABA Beliefs post) that give you an infinite number of choices you can make. The possible ways to react to a behavior are only limited by the information you have and what you know. So here is 1 more choice to add to your arsenal: The Count & Mand Procedure. CHILD WANTS SOMETHING AND THEY CAN HAVE IT BUT NOT FOR DISRUPTIVE BEHAVIOR. Tell the child to stop behavior or say "quiet" and begin counting. Counting can be out loud, or by showing fingers and doing a countdown. I usually count to 10. If problem behavior continues during count, re start the count. Do not restart the count more than 3 times (child only has 3 opportunities to calm down). If child runs off/walks away, stop the count. When you have finished your countdown with no problem behaviors, prompt child to request desired item or activity with acceptable form of communication (this can be sign language, PECS, pointing, touching, or verbal). 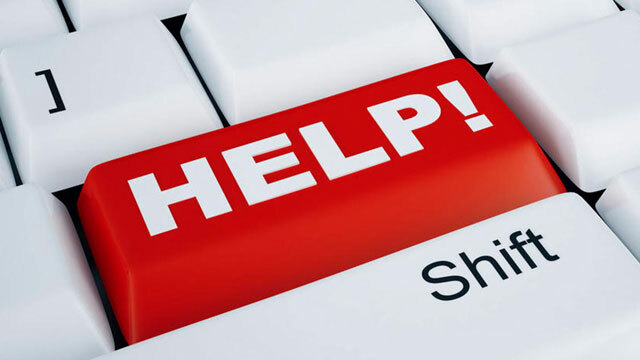 Deliver item for proper communication and be sure to reinforce appropriate manding. When child stops problem behavior for 1 minute return and redirect them to something else. If problem behavior occurs, place a compliance demand on the child specific to the setting. If in school direct to next activity (“Clean up toys”). Once the child has completed the compliance demand you may reinforce him/her. If problem behavior continues, be prepared to ignore it (always remembering to ignore the behavior, not the child). Try to avoid reinforcing the inappropriate behavior, such as leaving the grocery store because the child won’t stop crying. Reinforcement and Bribery are not the same thing. If you are unsure if you are using reinforcement or bribes, ask yourself if the target behavior is likely to go up or down in the future. You are only using reinforcement if the target behavior goes up. A good way to help children accept "no" is to teach "no but" first. For example "No you cannot have ice cream, but you can have some juice". Basically you are providing the child with an alternate choice. Eventually you want to use a mix of "no but" and "no", until the child can successfully accept a "no". If a count and mand procedure does not work wait at least 10 minutes before trying again. Do not feel rushed to calm the child down or to make the problem behavior stop. The child will realize that there are a finite amount of opportunities you will give them to mand properly before you walk away, and the door to reinforcement is closed. This post was really helpful to read. I feel like in my training it was discussed that tantrums would happen, and we talked about ignoring the inappropriate behaviors, but we didn't really discuss just HOW to handle the tantrums. I have yet to experience one, but I know it's just a matter of time! But just know when you do have to start dealing with severe behaviors that there are SO many options available to you for how to teach more appropriate behaviors. Count & Mand is just one option of many. I really need to research more of those options, for my own sanity. I don't feel prepared to deal with them which is nerve wracking. I'm also still getting used to simply giving a demand without saying "Please do ____" or "Can you please _____". I'm still trying to step of my previously role as a nanny and step into the behavioral interventionist role! It's taking some getting used to. I agree with you, and you're not alone in feeling that way. 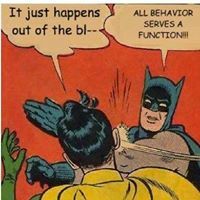 For educators, parents, babysitters, etc, it is often hard to learn to act like a "behaviorist". Just simple things like learning to state a demand, not ask a question can be a challenge. I see that a lot. Thank you this. This was really helpful to me.